Would it be viable to use jet blast deflectors as a power source? For increased operation time, the apparatus can move with the airplane until a certain speed (configurable) is achieved (cable not included). From an environmental point of view would installation of windmills just before jet blast deflectors provide enough power to power up all machinery at airports? From an environmental point of view? Not sure what that has to do with providing power, but no, here's why: First, many airports do not have jet blast deflectors at the ends of runways or in a place that sees most of the jet blast. Aside from that, windmills (wind turbines) can't spin at unlimited speed. Here's what happens one one goes too fast (small turbines have the same issue, but can stand wind speeds up to 100-ish mph). 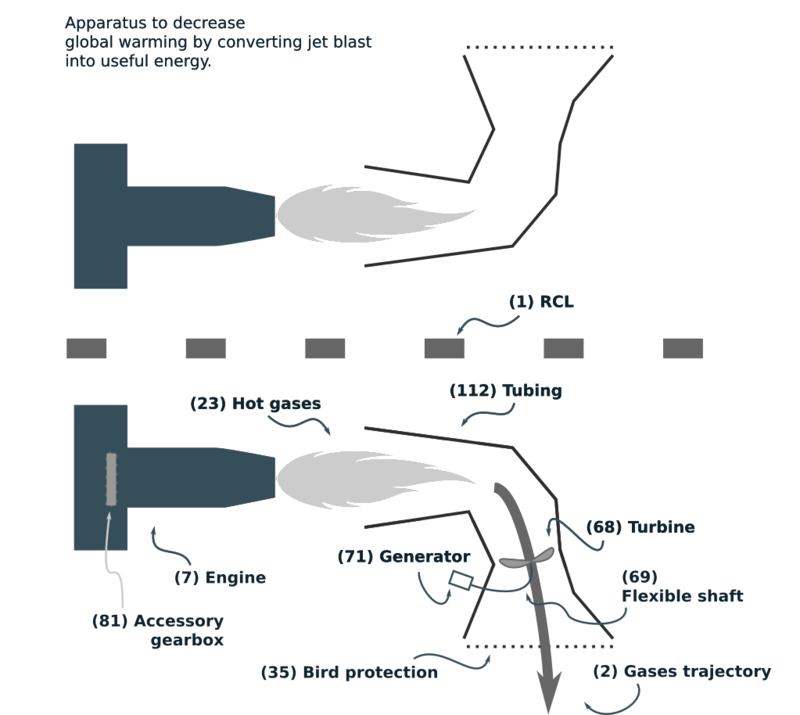 Turbines are designed such that they have an optimal output within some speed range, below that they don't generate much power, and above that they can get hot and fail, or have to be throttled back to stay in the power band. So seeing as how you would need to have them close to the ground where they aren't useful for natural breeze, providing major power to the airport is not going to happen. How much of a reduction in reliance on fossil fuel sources of energy would that be? Why do you assume that the airport runs on fossil fuels? Many airports are running "green" initiatives, installing solar panels and bio-diesel reactors. They may also be purchasing renewable energy credits so that they try to get a good portion of the power used from renewable sources, such as wind farms. Cost: There would be an extremely high acquisition cost, all the taxiways would have to be reworked to include this system. Even if it were an autonomous tow vehicles, the structure is not free. The tow's have to be created, programmed, vetted, certified, etc. Maintenance: There is a lot of infrastructure to maintain, the tow vehicles, the electronic systems, mechanical systems, etc. This requires a full-time crew, and I'm sure they aren't going to work for free, plus enough on-hand spares to be able to quickly repair the system when it goes down. Logistics: You have to have the tow mechanisms in place to catch the aircraft as they come off the runway. This means enough tow mechanisms to tow all aircraft and transit back to the runway possibly empty to catch another aircraft. Other issues... Aircraft can't just shut down engines right after they land. Many engines have cool-down times before they can be shut down. They also can't just fire them up at the end of the runway, there are start-up times and warm-up periods. Aircraft also need to power systems on the way to the runway, air conditioning, avionics, hydraulics, etc. Honestly these tow systems are not economically viable at this time. Aircraft are extremely fuel efficient (although not on the ground), but they have procedures to mitigate fuel expense on the ground. They shut down unused engines, turn off anything that isn't required, and reduce power consumption. If you are looking for ways for the airport to save energy or generate it themselves, then solar panels or these tiles that generate electricity are more viable. An airport uses about 20 MW of electricity, on average. That is to say, averaged over 365 days, 24 hours a day. Your windmill will have a peak production of about 1MW. And that's for very short periods only. Pilots, if only for economic reasons, don't run engines at high power unless they actually want to move the plane. That means they operate close to your windmill for short periods only. It's far more economical to put solar panels between all the runways and taxiways. There are large areas there where you can't put anything significantly above ground level, as wings will travel over this area. But as they're not intended to be driven on, these areas can have solar panels as long as they're anchored to the ground. Solar panels can put out 100MW per square kilometer during the day. Not the answer you're looking for? Browse other questions tagged airport airport-design emissions or ask your own question. Why would an airport use crossing runways for takeoff and landings? Is there any technical reason that prevents installation of a jet blast deflector at Princess Juliana airport? Is there a significant difference between the jet blast from Airbus and Boeing? Are the jet blast fences positioned other way around in this video?